Feverish and desperate, Fenton runs from his sickbed and mounts the wall at the rear of his halfway house — hoping to plunge to his death and end his misery. Looking down, Fenton is repulsed by the sight of the river below, and falls backwards to the frozen ground. Description: The wall that Fenton mounts is at the rear of Air Cottage — the real-life location of 'Fenton's halfway house'. Where is it? 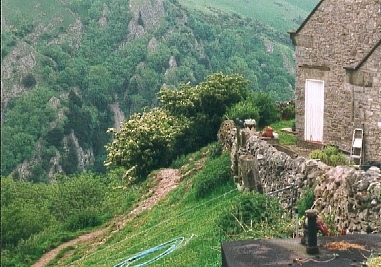 : Air Cottage is located high above the Dovedale gorge, close to the village of Ilam. It is accessible via a number of public footpaths (marked on Ordnance Survey maps of the area) and from a track leading off the road between Ilam and Alstonfield. The entrance to the track (which begins with a cattlegrid) is located on the right hand side near the brow of the first hill after leaving Ilam. The track passes Ilam Tops Farm (Ellen and Ron's Farm) before reaching Air Cottage. Where's the best vantage point? : Several shots are used in this scene: a camera films from the courtyard in front of Air Cottage as Fenton runs around the back of the house, mounts the wall, and looks down; a second 'crash zoom' shot reveals the river beneath him; and a third close-up captures — from below — Fenton's aghast reaction. The photo used here demonstrates that the scene Morris Perry (Fenton) 'looked down on' is not as it appears on screen. What about access? : The public footpath which leads past Ilam Tops Farm towards Air Cottage swings to the right of Air Cottage, before rejoining the main farm track on the far side of the farm. While it is possible to take many Ilam location shots from public pathways, this particular shot is taken on farm property with the permission of the owners. The owners of Air Cottage have always been very accommodating to Survivors fans, but they do ask, as a courtesy, that visiting fans check with them (in advance or on the day) if they wish to take photographs on farm property. For contact details for Air Cottage, click here. There are public footpaths criss-crossing the area around Ilam and Dovedale, but these should be checked closely to avoid trespassing on private land. It is advisable to carry an OS map when visiting these locations. Anything else? : Once again, Mad Dog's director Tristan de Vere Cole cuts together shots from different locations to secure the dramatic effect he is after. As the location photo makes plain, the river Fenton sees from the top of the wall is not to be found at the foot of the hill behind Air Cottage — but was shot from the top of the Monsal Viaduct, see here. The very limited parking at Air Cottage is private, and prior permission should be sought before making use of it. Alternatively, park in Ilam and approach the area on foot. The walk from the centre of Ilam is a fairly steep 30-40 minute climb - either by following the road uphill or (for those comfortable using OS maps) taking one of the footpaths up over the fields..